Pavakkai / Bitter gourd has lot of medicinal properties. But because of its bitter taste most of them do not like this vegetable. But I love this vegetable. Today I am posting a simple stir fry made with it. I came across this recipe from my friend Priya's site. I have prepared this so many times now and I really love this simple poriyal. Cut the pavakkai, scoop out the seeds and dice them. Then soak them in salted water for at least 10 minutes. This is done to reduce the bitterness from the pavakkai. Heat oil in a skillet, add mustard seeds and when they crack add onions, curry leaves and green chillies and fry for a minute or two. Then drain the pavakkai, squeeze excess water and add it to the pan and then add turmeric powder, chilli powder and coriander powder along with sugar and required salt and mix well. Cook in low flame, stirring in regular intervals till it is completely cooked. Serve it warm along with rice. Adjust chilli and chilli powder according to your heat tolerance. Instead of adding chilli powder and coriander powder, you can add sambar powder too. Priya has added amchoor powder to the poriyal. I tried adding about 1/2 teaspoon and I loved it. 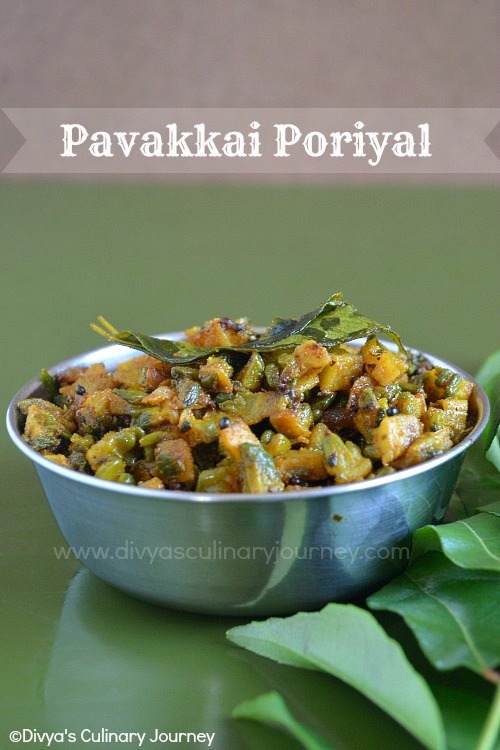 Love your pavakkai poriyal.. Nice clicks..
its my favorite too, looks delicious. 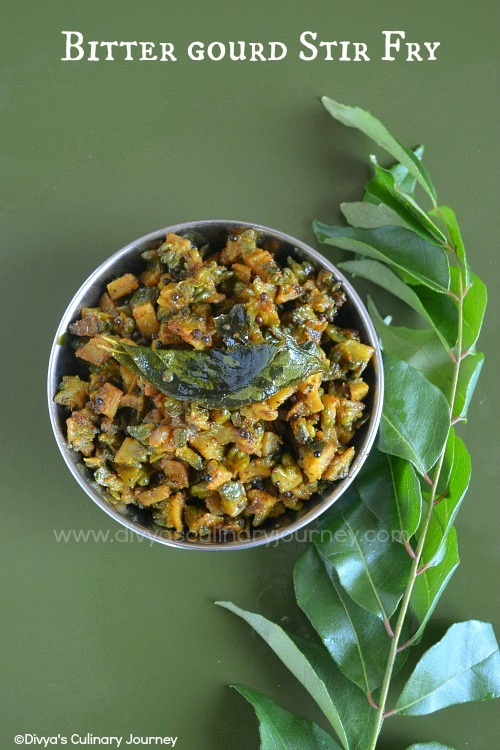 simply loved this healthy poriyal!! my favorite poriyal too..love it with sambar sadham :) looks too good n inviting...nice clicks da! Sabroso y muy completo me encanta una exquisitez,saludos y abrazos. I love bittergourd and this looks so good. like the green presentation :) i love to add potato with karela.. tempting da..
Karela is my favourite !